Sugary twee-pop duo the Boy Least Likely To dropped their second album, The Law of the Playground, last year. If you thought they couldn't get any more twee, however, they're willing to prove you wrong by revealing an upcoming album of precious Christmas songs. we've got a new album coming out at the end of november, which is a weird time to release an album. except it isn't, because it's a christmas album. so it's the perfect time to release an album. it's got eleven songs on it. eight of the are songs written by us and three of them are seasonal cover versions. fans of our previous christmas singles will be delighted to know that both the first snowflake and an extended version of little donkey are on there. it's released on the 29th of november and will be available on cd and as a digital download. if you buy the cd from rough trade you will also get a limited edition christmas card signed by us as well. which is nice. making a christmas album might seem like an odd thing to do, but some of our favourite songs are christmas songs. they make me so happy and so sad sometimes too. just like christmas itself. we've always been drawn to christmas songs and we've always written them. with the thought that someday we would have enough christmas songs to fill a whole album. and at last we have, so here it is. 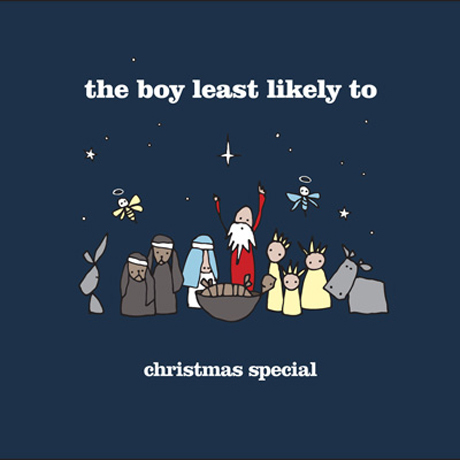 the boy least likely to christmas special. the christmas album we've always dreamed of making. Christmas Special will be released on November 30 in North America via +1 Recordings, and a day earlier on Too Young to Die in Europe. While we're definitely excited to check this album out over a nice glass of eggnog, there's no question the band missed out on a perfect album name. They should have called it Christmas Twee.